Fast Company came about due to Canada’s newly passed tax shelter incentive, which Cronenberg on Cronenberg author Chris Rodley noted was put in place to, “encourage private investment in an indigenous film industry.” While the incentive soon fell apart, David Cronenberg was able to benefit from it as a young director in need of work. Cronenberg recalled, “I was a hot property…I had a track record and there weren’t many other Canadian directors around”. So, despite the fact that he was strictly known at this point as a horror filmmaker, Croneneberg was brought on board for Fast Company. Originally scripted, from an outline by Alan Treen, as a rather straightforward exploitation stockcar-racing picture by actor, director and novice screenwriter Nicholas Campbell, Fast Company underwent some seriously needed tinkering by Croneberg once he was hired as director. Cronenberg had long had a major fascination and love for cars and racing, so he was excited about working on a film where he could give the same kind of attention to the racing industry as he had the destruction of the body and mind in his first films, Shivers and Rabid. Pre-production commenced in Edmonton where Cronenberg and Phil Savath began to tinker more and more with the script to give it some much needed realism and seriousness. Cronenberg told Rodley that he, “spent a lot of time with drag-racers and realized that they had this very rich verbal and visual idiom”, and that the original script had completely missed it. So, Cronenberg worked frantically to add the necessary flavor to the Fast Company script, and he quickly managed to give it an almost documentary feel that would greatly benefit the final product. Fast Company tells the story of Lonnie Johnson, a much loved but aging race-car driver who is slowly but methodically being pushed out of the sport by a greedy sponsor named Phil Adamson. Johnson, who is trying to exit the sport gracefully without being disgraced or killed, is attempting to nurture young drivers but is in constant battles with Adamson, who is only concerned with the financial backing and not the sport itself. There are several things that distinguish Fast Company from the endless number of auto-themed exploitation features that crowded theaters throughout the seventies, with the main being Cronenberg’s obsessive eye for detail. Cronenberg immerses the viewer in this very specific world and, from the first frame on, his passion is strikingly apparent. It isn’t a stretch to say that Fast Company is very much a precursor to Crash, the other film in Cronenberg’s canon obsessed with the complicated relationship between people and their cars. While Cronenberg’s great directorial hand is not a surprising factor in Fast Company’s success, the thing that really makes it run is its extraordinary cast, made up of some of the most notable faces in all of seventies cinema. Cronenberg told Rodley he never, “mythologized” b-movie actors in the way that, “guys like Scorsese had”, but he really enjoyed working with William Smith, John Saxon and Claudia Jennings. Fast Company is, in fact, one of the best acted films in Cronenberg’s filmography and it continued his streak of bringing out the absolute best in undervalued performers, like he had with Marilyn Chambers just a couple of years before in Rabid. 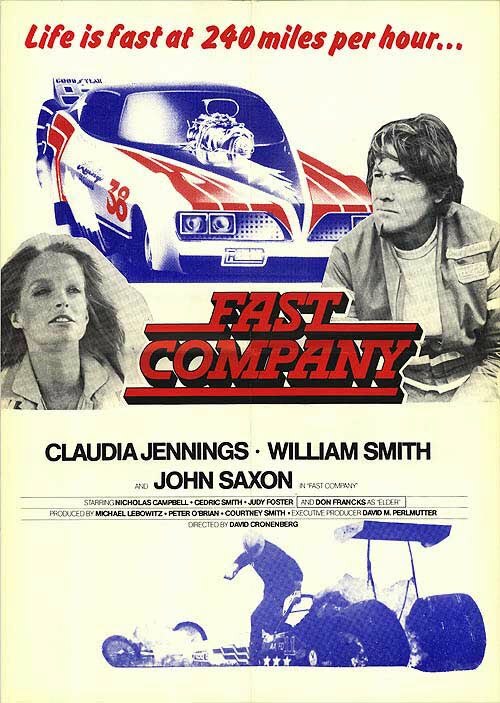 The main focus, involving the cast of Fast Company, is typically placed on beautiful Claudia Jennings, due to the fact that it was indeed her final film before her tragic death (sadly, in a car accident) at the age of just 29 . While Jennings is her usual and assured self as Johnson’s girlfriend Sammy, she is ultimately just a supporting player, and the film really belongs to William Smith and John Saxon, who both deliver mesmerizing performances as the dueling artist and moneyman. Smith gives an incredibly vibrant and dazzling performance as the past his prime driver Lonnie Johnson, and Saxon is at his smarmy and sinister best as the greedy and cruel promoter Adamson. Cronenberg allows each of his actors to absolutely shine, as his camera ultimately finds as much to love in their performances as the cars that had proven one of the director’s great life-long passions. Great behind-the-scenes players and cast aside, the thing that really makes Fast Company such an extraordinary picture is its look at the often violent and tumultuous relationship between those that hold the money and those who make the product. Saxon’s uncaring and cold character can easily be seen as a stand-in for the big money-hoarding Hollywood producers that Cronenberg, no doubt, knew that he would someday be facing. Cronenberg’s neglected work also contains the realization that the more successful he became as a filmmaker, the more he would be at the mercy of those holding the checkbooks. Even on the low-budget Fast Company, Cronenberg admitted that, like Johnson’s racing in the film, he had, “to struggle with other people’s concepts of what the movie was going to be.” The triumph of Fast Company is ultimately the triumph of David Cronenberg as an artist, for he has proven to be someone that the powers that be have attempted to corrupt and bend but he will simply not break. Despite the fact that most people have viewed Fast Company as a Cronenberg picture in name only, this is very much the work of one of our last great auteurs. Like The Dead Zone a few years down the road, Cronenberg managed to take someone else’s material and very much make it his own, and Fast Company’s still near anonymous state is extremely unfortunate. Barely distributed upon its release due to the problems with the tax-shelter incentive, as well as the fact that its U.S. distributor went, “belly up”, in Cronenberg’s words, Fast Company all but vanished before hardly anyone had a chance to see it in 1979. The film would sit mostly dormant for decades until William Lustig’s Blue Underground label would valiantly rescue it in 2004 with an astonishing DVD featuring a terrific commentary from Cronenberg, interviews with Smith, Saxon and Mark Irwin, and other assorted goodies (including the groundbreaking early shorts Stereo and Crimes of the Future on a bonus disc). The DVD proved to be a perfect release for a film that had had an all-but abortive release history. David Cronenberg would call Fast Company a “good solid B-Movie actioner with some interesting elements”, and it is those elements, that are extremely noteworthy in relation to the rest of his career, that make it so fascinating. Fast Company isn’t just a footnote in the career of David Cronenberg; it is a chapter. Great write-up, Jeremy. This has often been unjustly relegated to the bottom of Cronenberg's filmography yet it's so much more than his "Always Vanilla". Great idea for a blogathong, Tony. Saw this movie very long time back, only thing i recall was the shot of the hero, with two naked females in a trailer truck. Thanks for the wonderful take on a very unknown Cronenberg movie. Very much appreciate the defense of a movie most people don't watch (including many Cronenberg fans) although I'd say the FAST COMPANY disc is a lot better because of the inclusions of STEREO and CRIMES OF THE FUTURE - two films that have a lot "more to do" with Cronenberg's obsessions than FAST COMPANY, I think. It is a fun movie to watch (purely entertaining, you rightfully say) but there's not nearly as much going on as in those earlier shorts, or certainly the movies that bookend FC. Still, I thinkk J Hoberman called Cronenberg the most consistent commercial director of the last 30 years and I agree. He hasn't made a bad film (FC is totally worth watching although I think you might overstate its case a little) and just keeps going. No matter, kudos for keying in on an underseen work. My apologies for not commenting back sooner. Thanks so much for reading and offering your thoughts. I had a lot of fun writing this one and I appreciate Tony for including it in his great Blogathon. I saw this movie in Michigan in 1980, and for a long time (until now) thought I had just hallucinated seeing it. Wonderful review Jeremy, I'm on the lookout for a DVD of this great Cronenberg film. I finally got around to seeing FAST COMPANY, Jeremy. What a fun movie, more in line with those AIP/Corman type of seventies exploitation films than anything Cronenberg's ever done. But as soon as I realized it had William Smith, John Saxon AND Claudia Jennings, I knew this was a movie for me. And it's a nice showcase for Nick Campbell (THE DEAD ZONE's Dodd) as the young gun rising up through the "funny car" ranks.